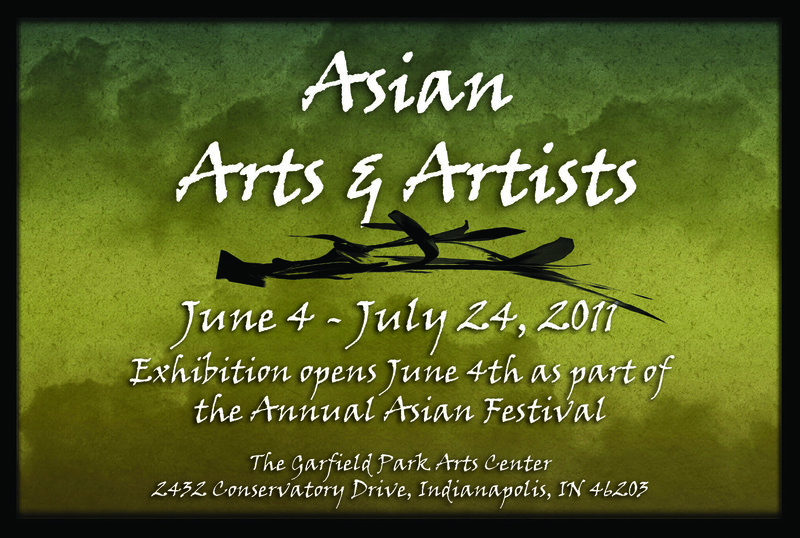 This summer Indy Parks and Recreation and the Garfield Park Arts Center (GPAC) will be hosting an Asian Arts & Artists Exhibition to compliment the annual Asian Fest presented by the Asian American Alliance. Works on display will include examples of the vibrant, exotic visual arts of Asia. From India to Japan to the Philippines, many rich cultural treasures will be represented. This exhibit will feature a blend of time-honored traditions and contemporary techniques. Artworks will include ceramics, paintings, textile arts and other mediums. The exhibit will be on display June 4th – July 24th, 2011, opening with the festival which takes place on the west lawn. Visitors to Asian Fest will have the opportunity to experience exotic art, dances, music and foods of Asia at this fun-filled festival for the entire family. They can beat the heat by stepping right into the GPAC Main Gallery to view the Exhibition. Visitors can also see the Bonsai Show and Koi ponds at the Garfield Park Conservatory & Sunken Garden. Asian artists and any artist working with Asian themes are invited to create and submit 2-3 works of original art for this exhibition. There is no cost to submit. Artworks that reflect and/or respond to the recent earthquake, tsunami and nuclear tragedies are strongly encouraged. Please indicate your desire to participate in the show by emailing Lesley Meier at Lesley.Meier@indy.gov by May 6, 2011. Or mail to The Garfield Park Arts Center, 2432 Conservatory Drive Indianapolis, IN 46203. Please include your name, address, phone number, email, a brief description of your work and a short bio. Please also include 3 samples of your work, either attached to the email or on a CD. Artists will be notified of all decisions no later than Wednesday, May 18, 2011. All works must be on site at the GPAC no later than Sunday May 29, 2011 at 5pm for a Monday installation. The GPAC reserves the right to refuse any work that is deemed inappropriate for the venue.